Aloe brevifolia Mill. var. serra (DC.) A.Berger, Aloe depressa Haw., Aloe serra DC. Known from a single site within a highly transformed area, last collected in 1936. Possibly severely threatened or locally extinct, but quite likely not clearly distinct from the more widespread typical variety. Shale cliffs and slopes in Rûens Shale Renosterveld. If this poorly known variant is proven to be significantly distinct from the typical variety it is quite likely highly threatened due to habitat fragmentation and degradation as a result of agricultural transformation. A. brevifolia var. depressa is distinguished from the typical variety mainly by the larger habit and a tendency not to form clumps, and Glen and Hardy (2000) chose to uphold the variety in their revision. 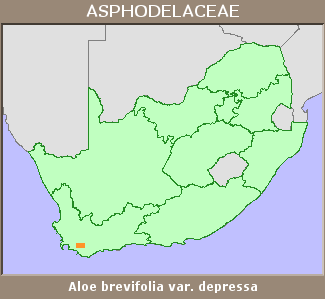 However, surveys of populations in the Caledon area (where both variants are known to occur) are necessary to determine whether variations within subpopulations do not include both forms � notes on a specimen collected by Bruyns (BOL 100420-0) north of Napier indicate considerable variation in plant size within a subpopulation. If var. depressa is found to be sufficiently distinct it is possibly in grave danger of extinction � only a 200 m² fragment of habitat remains near the only known locality.